『유가사지론』은 인도의 미륵보살이 지은 글을 당나라의 현장(602∼664)이 번역하여 천자문의 순서대로 100권을 수록한 것으로, 11세기에 간행한 초조대장경 가운데 하나이다. 이것은 100권 가운데 제15권으로, 처음 새긴 본이다. 종이질은 닥나무종이이며, 가로 47.6㎝, 세로 28.6㎝이다. 이 판본은 해인사에서 보관하고 있는 재조대장경 판본과 비교해보면 판수제와 권, 장, 함차 표시의 위치에 차이가 있다. 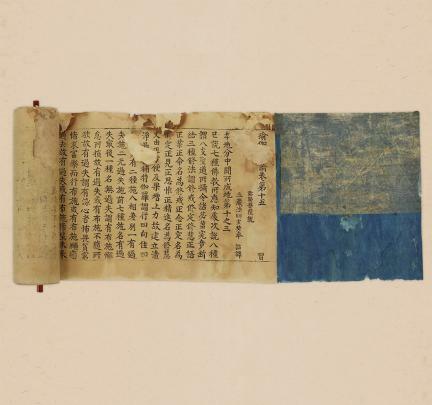 This is a first edition of Yogacaryabhumi Sutra, the 15th volume out of a set of 100 volumes, translated by Xuan zang, (A Chinese Buddhist monk: 602-664), Tang Dynasty. 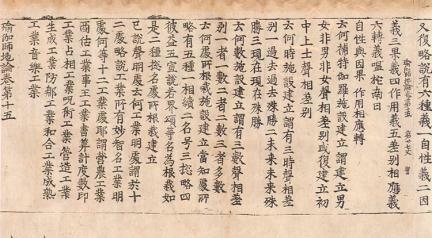 It was printed in the era of King Hyeonjong, Goryeo Period. 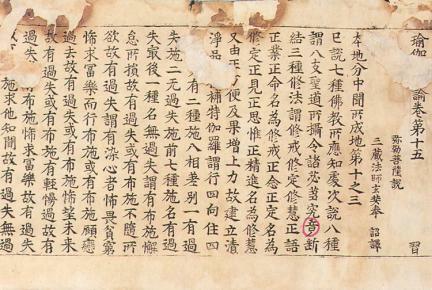 It has its indications of the edition, volume, chapter and unit, differently located, compared to the revised edition Tripitaka in Haeinsa Temple. A single page measures 47.6cm wide, 28.6cm long and it is presumably printed in the 11th century.